The politics of Spain takes place under the framework established by the Constitution of 1978. Spain is established as a social and democratic state, wherein the national sovereignty is vested in the people, from which the powers of the state emanate. The form of government in Spain is a parliamentary monarchy, that is, a social representative, democratic, constitutional monarchy in which the monarch is the head of state, while the prime minister — whose official title is "president of the Government" — is the head of government. Executive power is exercised by the government, which is integrated by the prime minister, the deputy prime ministers, and other ministers, which collectively form the Cabinet, or Council of Ministers. 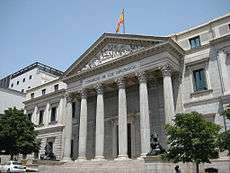 Legislative power is vested in the Cortes Generales (General Courts), a bicameral parliament constituted by the Congress of Deputies and the Senate. The judiciary is independent of the executive and the legislature, administering justice on behalf of the King by judges and magistrates. 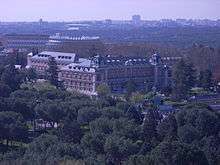 The Supreme Court of Spain is the highest court in the nation, with jurisdiction in all Spanish territories, superior to all in all affairs, except in constitutional matters, which are the jurisdiction of a separate court, the Constitutional Court. Spain's political system is a multi-party system, but since the 1990s, two parties have been predominant in politics, the Spanish Socialist Workers' Party (PSOE) and the People's Party (PP). Regional parties, mainly the Basque Nationalist Party (EAJ-PNV) from the Basque Country, and Convergence and Union (CiU) and the Socialists' Party of Catalonia (PSC) from Catalonia, have also played key roles in Spanish politics. Members of the Congress of Deputies are selected through proportional representation, and the government is formed by the party or coalition that has the confidence of the Congress, usually the party with the largest number of seats. Since the Spanish transition to democracy, there have not been coalition governments; when a party has failed to obtain absolute majority, minority governments have been formed. Regional government functions under a system known as the state of autonomies, a highly decentralized system of administration based on asymmetrical devolution to the "nationalities and regions" that constitute the nation, and in which the nation, via the central government, retains full sovereignty. Exercising the right to self-government granted by the constitution, the "nationalities and regions" have been constituted as 17 autonomous communities and two autonomous cities. The form of government of each autonomous community and autonomous city is also based on a parliamentary system, in which executive power is vested in a "president" and a Council of Ministers elected by and responsible to a unicameral legislative assembly. According to the Constitution, it is incumbent upon the King: to sanction and promulgate laws; to summon and dissolve the Cortes Generales (the Parliament) and to call elections; to call a referendum under the circumstances provided in the constitution; to propose a candidate for prime minister, and to appoint or remove him from office, as well as other ministers; to issue the decrees agreed upon by the Council of Ministers; to confer civil and military positions, and to award honors and distinctions; to be informed of the affairs of the State, presiding over the meetings of the Council of Ministers whenever opportune; to exercise supreme command of the Spanish Armed Forces, to exercise the right to grant pardons, in accordance to the law; and to exercise the High Patronage of the Royal Academies. All ambassadors and other diplomatic representatives are accredited by him, and foreign representatives in Spain are accredited to him. He also expresses the State's assent to entering into international commitments through treaties; and he declares war or makes peace, following the authorization of the Cortes Generales. The king is the commander-in-chief of the Spanish Armed Forces, but has only symbolic, rather than actual, authority over the Spanish military. Nonetheless, the king's function as the commander-in-chief and symbol of national unity have been exercised, most notably in the military coup of 23 February 1981, where King Juan Carlos I addressed the country on national television in military uniform, denouncing the coup and urging the maintenance of the law and the continuance of the democratically-elected government, thus defusing the uprising. The Senate has less power than the Congress of Deputies: it can veto legislation, but its veto can be overturned by an absolute majority of the Congress of Deputies. Its only exclusive power concerns the autonomous communities, thus in a way performing a function in line with its nature of "territorial representation". By an overall majority, the Senate is the institution that authorizes the Government to adopt measures to enforce an autonomous community's compliance with its constitutional duties when it has failed to do so. Since the constitution of 1978 came into effect, however, this has never occurred. At the national level, executive power in Spain is exercised only by "the Government". (The King is the head of state, but the constitution does not attribute to him any executive faculties). The Government is composed by a prime minister, known as the "president of the Government" (Spanish: presidente del gobierno), one or more deputy prime ministers, known as "vice-presidents of the Government" (Spanish: vicepresidentes del gobierno) and all other ministers. 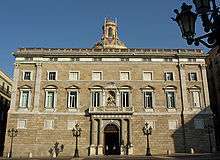 The collegiate body composed by the prime minister, the deputy prime ministers, and all other ministers is called the Council of Ministers. The Government is in charge of both domestic and foreign policy, as well as defense and economic policies. As of 21 December 2011, the prime minister of Spain is Mariano Rajoy, president of the People's Party, having been the leader of the opposition from 2004 to 2011. After the candidate obtains the confidence of the Congress of Deputies, he is appointed by the King as prime minister in a ceremony of inauguration in which he is sworn at the Audience Hall of the Palace of Zarzuela — the residence of the King — and in presence of the Major Notary of the Kingdom. The candidate takes the oath of office over an open copy of the Constitution next to a Holy Bible. The oath of office used is: "I swear/promise to faithfully carry out the duties of the position of president of the Government with loyalty to the King; to obey and enforce the Constitution as the fundamental law of the State, as well as to keep in secret the deliberations of the Council of Ministers". The constitution also guarantees certain degree of autonomy to two other political entities: the provinces of Spain (subdivisions of the autonomous communities) and the municipalities (subdivisions of the provinces). If the communities are integrated by a single province, then the institutions of government of the community replace those of the province. For the rest of the communities, provincial government is held by Provincial Deputations or Councils. With the creation of the autonomous communities, deputations have lost much of their power, and have a very limited scope of actions, with the exception of the Basque Country, where provinces are known as "historical territories" and their bodies of government retain more faculties. Except in the Basque Country, members of the Provincial Deputations are indirectly elected by citizens according to the results of the municipals elections and all of their members must be councilors of a town or a city in the province. In the Basque Country direct elections do take place. Spanish municipal administration is highly homogenous; most of the municipalities have the same faculties, such as managing the municipal police, traffic enforcement, urban planning and development, social services, collecting municipal taxes, and ensuring civil defense. In most municipalities, citizens elect the municipal council, which is responsible for electing the mayor, who then appoints a board of governors or councilors from his party or coalition. The only exceptions are municipalities with under 50 inhabitants, which act as an open council, with a directly elected major and an assembly of neighbors. Municipal elections are held every four years on the same date for all municipalities in Spain. Councilors are allotted using the D'Hondt method for proportional representation with the exception of municipalities with under 100 inhabitants where block voting is used instead. The number of councilors is determined by the population of the municipality; the smallest municipalities having 5, and the largest — Madrid — having 55. The Spanish Socialist Workers' Party (PSOE) is a social-democrat center-left political party. It was founded in 1879 by Pablo Iglesias, at the beginning as a Marxist party for the workers' class, which later evolved towards social-democracy. Outlawed during Franco's dictatorship, it gained recognition during Spanish transition to democracy, period when it officially renounced Marxism, under the leadership of Felipe González. It played a key role during the transition and the Constituent Assembly that wrote the Spanish current constitution. It governed Spain from 1982 to 1996 under the prime ministership of Felipe González, during which time the party adopted a socio-liberal economic policy. It governed again from 2004 to 2011 under the prime ministership of José Luis Rodriguez Zapatero. The People's Party (PP) is a conservative centre-right party that took its current name in 1989, replacing the previous People's Alliance, a more conservative party founded in 1976 by seven former Franco's ministers. In its refoundation it incorporated the Liberal Party and the majority of the Christian democrats. In 2005 it integrated the Democratic and Social Center Party. It governed Spain under the prime ministership of José María Aznar from 1996 to 2004, and again from December 2011 to December 2015, headed by Mariano Rajoy. Convergence and Union (Catalan: Convergència i Unió, CiU), a coalition of two Catalan nationalist parties; after its dissolution Democratic Convergence of Catalonia (Catalan: Convergència Democràtica de Catalunya, CDC) renamed as Democràcia i Llibertat. Elections to the Cortes Generales are held every four years or before if the prime ministers calls for an early election. Members of the Congress of Deputies are elected through proportional representation with closed party lists where provinces serve as electoral districts; that is, a list of deputies is selected from a province-wide list. Under the current system, sparsely populated provinces are overrepresented because more seats of representatives are allocated to the sparsely populated provinces than they would have if number of seats are allocated strictly according to the population proportion. In the Senate, each province, with the exception of the islands, select four senators using block voting: voters cast ballots for three candidates, and the four senators with the largest number of votes are selected. The number of senators selected for the islands varies, depending on their size, from 3 to 1 senators. A similar procedure of block voting is used to select the three senators from the three major islands whereas the senators of the smaller islands or group of islands, are elected by plurality. In addition, the legislative assembly of each autonomous community designates one senator, and another for each additional one million inhabitants. The end of the Spanish Civil War, put at end to the Second Spanish Republic (1931–1939), after which a dictatorial regime was established, headed by general Francisco Franco. In 1947 he decreed, in one of the eight Fundamental Laws of his regime, the Law of Succession of the Head of State, that Spain was a monarchy with a vacant throne, that Franco was the head of State as general and caudillo of Spain, and that he would propose, when he deemed opportune, his successor, who would bear the title of King or Regent of Spain. Even though Juan of Bourbon, the legitimate heir of the monarchy, opposed the law, Franco met him in 1948, when they agreed that his son, Juan Carlos, then 10 years old, would finish his education in Spain — he was then living in Rome — according to the "principles" of the Francoist movement. In 1969, Franco finally designated Juan Carlos as his successor, with the title "Prince of Spain", bypassing his father Juan of Bourbon. Adolfo Suárez headed the prime ministership of Spain from 1977 to 1982, as the leader of the Union of the Democratic Center party. He resigned on 29 January 1981, but on 23 February 1981, day when the Congress of Deputies was to designate a new prime minister, rebel elements among the Civil Guard seized the Cortes Generales in an a failed coup that ended the day after. The great majority of the military forces remained loyal to the King, who used his personal and constitutional authority as commander-in-chief of the Spanish Armed forces, to diffuse the uprising and saving the constitution, by addressing the country on television. 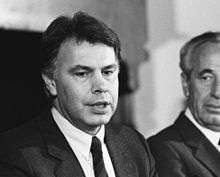 In October 1982, the Spanish Socialist Workers' Party, led by Felipe González, swept both the Congress of Deputies and Senate, winning an absolute majority in both chambers of the Cortes Generales. 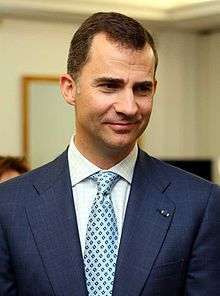 González headed the prime ministership of Spain for the next 13 years, during which period Spain joined the NATO and the European Community. 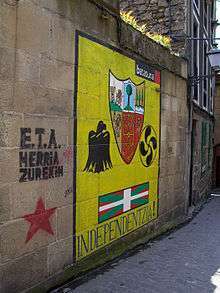 Spain has also contended with a Marxist resistance group, commonly known as GRAPO. GRAPO (Revolutionary group of October the 1st) is an urban guerrilla group, founded in Vigo, Galicia; that seeks to overthrow the Spanish Government and establish a Marxist–Leninist state. It opposes Spanish participation in NATO and U.S. presence in Spain and has a long history of assassinations, bombings, bank robberies and kidnappings mostly against Spanish interests during the 1970s and 1980s. ↑ Also identified as a "historical community" in its Statute of Autonomy. ↑ Also identified as a "historical and cultural community" in its Statute of Autonomy. ↑ The Community of Madrid was detached from Castile-La Mancha to conform a distinct autonomous community in the nation's interest since its capital, Madrid, is also the capital of the Spanish nation, and seat of the State's institutions of government. It is therefore, not referred to neither as a region nor as a nationality in its Statute of Autonomy. ↑ Navarra acceded to self-government through the "reintegration" and "improvement" of its medieval charters whereby it had some autonomy to manage its internal affairs. ↑ In Valencia, the language is historically and officially known as Valencian. 1 2 3 First article. Cortes Generales (27 December 1978). "Spanish Constitution". Tribunal Constitucional de España. Retrieved 28 January 2012. ↑ Article 56. Cortes Generales (27 December 1978). "Spanish Constitution". Tribunal Constitucional de España. Retrieved 28 January 2012. ↑ Abellán Matesanz, Isabel María. "Sinópsis arículo 56 de la Constitución Española (2003, updated 2011)". Cortes Generales. Retrieved 18 February 2012. ↑ Article 61. Cortes Generales (27 December 1978). "Spanish Constitution". Tribunal Constitucional de España. Retrieved 28 January 2012. ↑ Article 62. Cortes Generales (27 December 1978). "Spanish Constitution". Tribunal Constitucional de España. Retrieved 28 January 2012. ↑ Article 63. Cortes Generales (27 December 1978). "Spanish Constitution". Tribunal Constitucional de España. Retrieved 28 January 2012. 1 2 3 Solsten, Eric; Meditz, Sandra W. (1998). "King, Prime Minister, and Council of Ministers". Spain, a country Study. Washington GPO for the Library of Congress. Retrieved 18 February 2012. 1 2 3 4 5 6 7 8 9 10 11 12 13 Sir Raymond Carr; et al. "Spain". Encyclopædia Britannica Online. Encyclopædia Britannica, Inc. Retrieved 28 January 2012. 1 2 Merino Merchán, José Fernando (December 2003). "Sinópsis artículo 62 de la Constitución Española". Cortes Generales. Retrieved 18 February 2012. 1 2 Article 57. Cortes Generales (27 December 1978). "Spanish Constitution". Tribunal Constitucional de España. Retrieved 28 January 2012. 1 2 Abellán Matesanz, Isabel María. "Sinópsis arículo 57 de la Constitución Española (2003, updated 2011)". Cortes Generales. Retrieved 18 February 2012. ↑ "Spain". The World Factbook. Central Intelligence Agency. Retrieved 30 March 2014. ↑ Alba Navarro, Manuel. "Sinópsis artículo 66 de la Constitución Española (December 2003, updated 2011)". Cortes Generales. Retrieved 19 February 2012. 1 2 Alba Navarro, Manuel. "Sinópsis artículo 69 de la Constitución Española (December 2003, updated 2011)". Cortes Generales. Retrieved 19 February 2012. 1 2 Article 99. Cortes Generales (27 December 1978). "Spanish Constitution". Tribunal Constitucional de España. Retrieved 28 January 2012. ↑ Article 107. Cortes Generales (27 December 1978). "Spanish Constitution". Tribunal Constitucional de España. Retrieved 28 January 2012. ↑ Article 117. Cortes Generales (27 December 1978). "Spanish Constitution". Tribunal Constitucional de España. Retrieved 28 January 2012. ↑ Article 159. Cortes Generales (27 December 1978). "Spanish Constitution". Tribunal Constitucional de España. Retrieved 28 January 2012. ↑ Article 2. Cortes Generales (27 December 1978). "Spanish Constitution". Tribunal Constitucional de España. Retrieved 28 January 2012. ↑ Article 6. Cortes Generales (27 December 1978). "Spanish Constitution". Tribunal Constitucional de España. Retrieved 28 January 2012. 1 2 Colomer, Josep (2004). Hand Book Of Electoral System Choice. New York: Palgrave Macmillan. p. 262. ISBN 1-4039-0454-5. 1 2 3 4 5 Álvarez-Rivera, Manuel. "Elections to the Spanish Congress of Deputies". Retrieved 2 May 2012. 1 2 3 González, Yolanda (23 December 2007). "Las verdades y mentiras de la ley electoral". El País. Retrieved 19 February 2012. ↑ Baldini, Gianfranco; Pappalardo, Adriano (2011). Elections, Electoral Systems and Volatile Voters. New York: Palgrave Macmillan. p. 67. ISBN 978-0-230-57448-9. ↑ Farrell, David (2011). Electoral Systems: A Comparative Introduction (2 ed.). New York: Palgrave Macmillan. pp. 74–77. ISBN 978-1-4039-1231-2. 1 2 3 4 Baldini, Gianfranco; Pappalardo, Adriano (2011). Elections, Electoral Systems and Volatile Voters. New York: Palgrave Macmillan. pp. 67–69. ISBN 978-0-230-57448-9. ↑ Norris, Pippa (2004). Electoral Engineering - Voting Rules and Political Behavior. USA: Cambridge University Press. p. 87. ISBN 0-521-82977-1. ↑ Farrell, David (2011). Electoral Systems: A Comparative Introduction (2 ed.). New York: Palgrave Macmillan. pp. 67–74. ISBN 978-1-4039-1231-2. ↑ Baldini, Gianfranco; Adriano Pappalardo (2011). Elections, Electoral Systems and Volatile Voters. New York: Palgrave Macmillan. pp. 61–64. ISBN 978-0-230-57448-9. ↑ Farrell, David (2011). Electoral Systems: A Comparative Introduction (2 ed.). New York: Palgrave Macmillan. p. 154. ISBN 978-1-4039-1231-2. ↑ Gunther, Richard; Monero, José Ramón (2009). "The Politics of Spain". Cambridge Textbooks in Comparative Politics. Retrieved 25 February 2012. 1 2 3 4 "Spain Politics, government, and taxation". Encyclopedia of the Nations. Retrieved 25 February 2012. 1 2 3 4 5 Minder, Raphael (20 November 2011). "Spanish Voters Deal a Blow to Socialists over the Economy". The New York Times. Retrieved 25 February 2012. ↑ Jones, Sam (27 June 2016). "Spanish elections: Mariano Rajoy struggles to build coalition". The Guardian. ↑ Jones, Sam (31 October 2016). "Mariano Rajoy sworn in as Spain's PM after deadlock broken". The Guardian. ↑ Villar, Fernando P. (June 1998). "Nationalism in Spain: Is It a Danger to National Integrity?". Storming Media, Pentagon Reports. Retrieved 3 February 2012. ↑ Shabad, Goldie; Gunther, Richard (July 1982). "Language, Nationalism and Political Conflict in Spain". Comparative Politics Vol 14 No. 4. Retrieved 3 February 2012. ↑ "Nacionalidad". Real Academia Española. Retrieved 28 January 2012. ↑ Lewis, Martin W (1 September 2010). "The Nation, Nationalities, and Autonomous Regions in Spain". GeoCurrents. Map-Illustrated Analyses of Current Events and Geographical Issues. Retrieved 29 January 2012. ↑ Conversi, Daniele (2002). "The Smooth Transition: Spain's 1978 Constitution and the Nationalities Question" (PDF). National Identities, Vol 4, No. 3. Carfax Publishing, Inc. Retrieved 28 January 2008.